"Hey, extreme measures, right?" RLJ Entertainment has unveiled the official trailer for Joe Lynch's action horror comedy Mayhem, an all-out takedown of corporate culture. The plot involves a virus that infects people and makes them go crazy, beating people up or acting out their worst impulses. When the virus takes over a corporate office building, the employees go insane and start fighting each other. One of them, Derek Cho played by Steven Yeun, decides to take matters into his own hands and fight his way to the executive level. Co-starring Samara Weaving, Steven Brand, Caroline Chikezie, Kerry Fox, Dallas Roberts, Mark Frost, Claire Dellamar, André Eriksen. I just saw this at the Sitges Film Festival and it's actually a very entertaining film, with some brutal violence and a good message at the end. Worth a watch - enjoy. When a corporate law office is quarantined after a dangerous virus that makes the infected lose their inhibitions is discovered, a recently fired employee and a wronged client must battle their way to the executive level before time runs out. 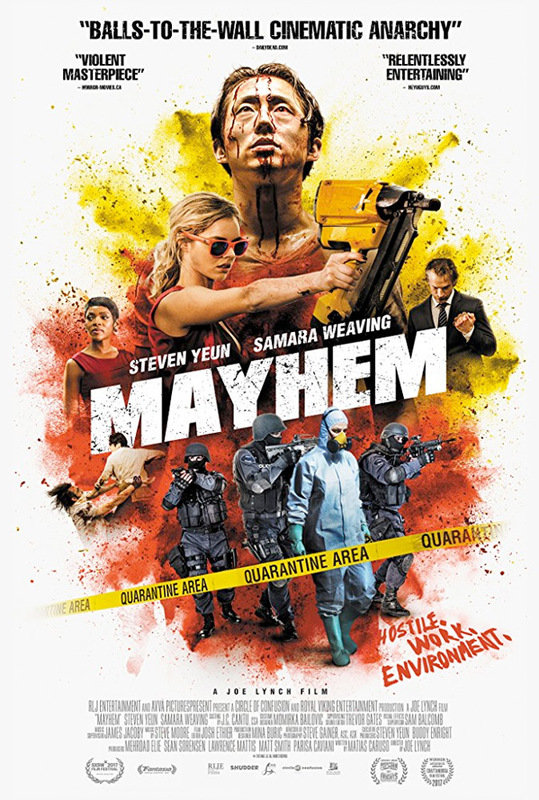 Mayhem is directed by indie filmmaker Joe Lynch (follow him @TheJoeLynch), of the films Everly, Knights of Badassdom, and Wrong Turn 2: Dead End previously. The screenplay is written by Matias Caruso. This first premiered at the SXSW Film Festival this year, and has played at numerous other fests including at the Sitges Film Festival most recently. RLJ Entertainment will release Lynch's Mayhem in select theaters + on VOD starting November 10th this fall. Anyone interested?